When I first met Nate I’m sure neither of us knew what good friends we would become. It all started 5 years ago or so with motorcycles and some mutual friends that brought us together, you see 5 years ago I had just inherited a Yamaha FZ09 from my brother and I was new to motorcycling. Some longtime friends of mine had mentioned that there was a guy they knew that had just gotten a bike too, and that I should ride with him. That’s when I first met Nate, he was as down for riding as I was. Literally every day we were riding, he had just bought a new R6 and both of our skill levels were on the low side as we were both new to riding. Everyday day was a whole new experience, we would meet up then going out north, south, east, west, long rides, and short rides it didn’t matter it was just awesome being on our bikes. All the while I was still living my 2nd life of cars that at the time I figured Nate wasn’t very into, so we never really talked about cars. I knew that he had an s13, but it wasn’t registered, it was all stock, and just a ka24e. Like I said though cars never really came up between us we were just so hyped on motorcycles that I never wanted to even talk about cars with him. It went on this way for years, I had motorcycle friends and I had car friends, neither one of them ever truly understanding the other life I lived. I mean my car friends knew that I rode, and my moto friends knew that I liked cars but we never commingled. A few years into riding we were both outgrowing our bikes, as we rode our skill level grew and for me especially my FZ09 just wasn’t up to the challenge I was pretty much riding that bike to its limit. 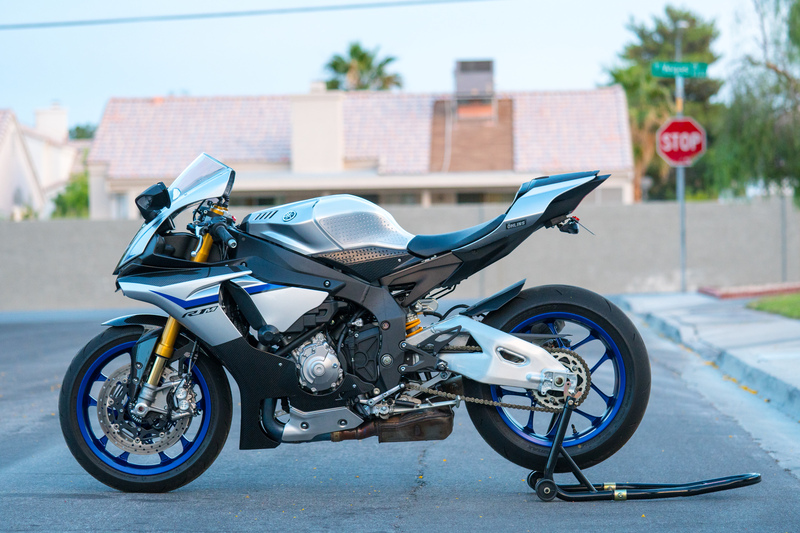 In 2016 I bought an R1M, a few months later Nate traded up for an RSV4, we were both riding our dream bikes and loving every moment of it. I still had my FZ09 that I would ride daily, and Nate since he traded in his R6 was now dailying his RSV4. In early 2017 I was involved in a car accident while riding my FZ09, I was out of work for 3 months and still have an ongoing lawsuit which has stopped me from riding my FZ09 as a daily, and I wasn’t about to ride the R1M and leave it parked outside at my work. So I began using my truck as my daily, throughout this whole time Nate was still riding his RSV4 every day to work and any other errands he would have to do. This was racking up miles on his bike, which was like driving a Ferrari every day to work and back, It’s just not what you do. 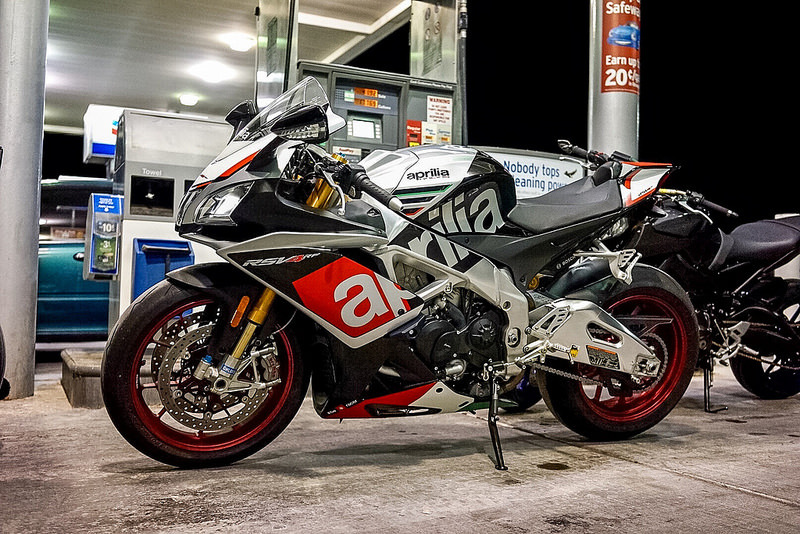 The RSV4 is a piece of finely crafted Italian machinery, that was more MOTO GP bike than drive it everyday on the road bike. Nate began to realize this and randomly he heard that a friend, of a friend, of a friend was selling a civic for super cheap. He figured he could just park the RSV4 and only ride it whenever we go ride, and then he could just daily a civic. This ended up being the biggest mistake for many reasons. 1, this would be quite possibly the worst civic anyone could have ever bought. 2, Nate was now going to cross our very specific friendship lines, he was about to crossover into Vtec town. 3, he was going to be bitten by the Vtec bug, and it was going to bite hard. 4, he was going to get a crash course in Hondas, and he was about to truly understand the passion I had for them, if he thought I loved motorcycling wait till we started doing car stuff. Nate bought a 99 civic ex. He had asked me what I thought, and for the price he got it for (800 bucks) I figured if it ran and drove straight then it was worth 800 bucks. I never actually looked at the car before he bought it I just saw pictures, I just told him to have our friend Bobby put it on a lift at work and take a look and throw it on the alignment rack to make sure it’s straight. Bobby called me and told me that it was rough, but it did align straight and it did run lol. The day that Nate actually bought it he was happier than a tornado in a trailer park, I can still distinctly remember his happy face as he drove it on to my street. I was outside awaiting his arrival, he pulled on my street and with a grin from ear to ear he stopped in front of my house. I was signaling to him to “kill it” “shut it off” “STOP” there was a major problem with his car… Like MAJOR problems. His car was making the worst clicking/ticking, metallic sound come from the engine and I could tell right as he turned on to my street that something was very wrong. My first assumption was the valves were way out of spec, or super loose. I told Nate to pull it in the driveway and I would throw a quick valve adjustment on it, Just as I expected they were beyond loose. We adjusted them back into spec and I had him turn the car on. ( I know that to do a proper valve adjustment you should always allow for the engine to cool ) this was just such a drastic case that I figured anything would make it sound better, we could always properly adjust them another day. He turned the car on and it sounded just as bad??? I was blown away, it was a distinct noise coming from the head. not rod knock, or throw out bearing. Puzzled I told him to shut it off and let’s take the valve cover off again, let me look closer…HMMM, was the car timed correctly? BINGO! there was the problem the timing was 180* off. I can’t even believe he drove the car to my house, or even yet bought such a piece of crap. Who in their right mind thought this was the way a car should sound? I mean c’mon Nate you have heard other cars your whole life, you have driven other cars, this is not what they should sound like. I Fixed the timing so all the marks were at TDC, I then had to do another valve adjustment ( this is why the valves were so loose in the first place ) I got it all back together and fired it up. Vroom, it was purring like a kitten, I threw the timing light on it and dialed it all in. He couldn’t believe how quiet it was, no metallic noise coming from the head anymore, Unfortunately the damage had already been done. The person he had bought the car from clearly sold it because they royally fucked it up and had no business being anywhere near any machinery, let alone the messing up the amazing masterpiece of a car that is Honda. Nate left my house that night beaten but not out, he was going to put this car on life support and fix it up. We ended up doing a compression test soon after, then immediately did the head gasket, when he went to pick up the head from the machine shop after getting resurfaced, The guy behind the counter noticed that it seemed like some parts were missing from the valve terrain. It ended up missing two vtec synchronizing pins ( which is what is needed to engage vtec, oil pressure pushes these pins into the third lobe and allows the car to “hit” vtec.) Unbelievable! what did the previous owner do to this poor car, it didn’t deserve any of the mistreatment or lack of love it had gotten. So we sourced two synchronizing pins reassembled the valve terrain correctly put the head back on and got it running. It ran 100x better and 1000x better than the first day he drove it to my house. But still the damage was already done, he managed to drive the car for about 6 months but it was burning oil like a… a bad motor. He truly loved his car, and was not discouraged. He would still go on to put OEM radiator fluid in it, OEM spark plugs, a new throw out bearing, new oem fuel filter, and change the oil frequently. throughout those six months he was also on forums, YouTube, and searching the internet trying to learn as much as he could about Hondas. He was cultivating the seed I had planted. He was hanging out with me when I was doing car stuff, He was meeting all my car friends, he was at the track events watching us do our thing. Not to brag but he hit the car friend jackpot with me, I mean he was looking at Kswap, spoon part, tastefully built, track driven, Nsx, TE37, civic, jdm, mad vtaak cool stuff before he even knew what he was looking at. I was able to help guide him to understand why functional is cool, why we don’t put bags or high negative camber on our cars, why it’s not cool to just lower your car and put an ebay exhaust on it, the proper ways to tastefully modify a car, and enjoy driving more. Put it this way, one day I needed an extra foot to help me bleed my brakes. He came by and we bled my brakes, then when we were done I told him to just go take it for a test drive to make sure the brakes work. He was nervous and maybe a bit timid because he knew that this was my race car and that I cared very much for it, I proceeded to tell him to not worry about it ” it’s a race car, you’re not going to hurt it ” since I knew he was a normal person that could actually drive stick, and that he was able to get a license to drive when he turned 16 that he was going to do just fine “making sure my brakes worked”. He pulled out of my driveway and went to the end of my street and back, how are they? I ask. he’s unsure, so I tell him to drive out on the main street, go up and down few times to see if they “work like brakes”. He was nervous, I said “don’t be” just drive it like a car. When he gets back to my house everything is fine and the brakes are working properly, he realizes that he was driving with the ebrake on. He is very apologetic, I told him its ok, if I was worried you would have actually messing something up I wouldn’t have let you drive it. So he left the ebrake on while he drove it pfff big whoop it for less than 1/2 a mile, no harm no foul. But the main thing about this story is that he was able to drive my 250 hp K20 swapped 5.1 final drive race car of a civic before he even knew what any of that meant. We often look back on this and laugh, he says “I can’t believe you let me drive it” I tell him I only let him drive it because he didn’t know what it actually was, and that he won’t ever drive it again. because now he knows just how crazy my car is, so now if he drove it he would take it to the max and possibly damage something. For the six months he drove his civic it was just one headache after another. He wanted so badly to fix it up, but I wouldn’t let him. I just couldn’t as a friend recommend throwing money into it. the chassis was GARBAGE, it was like the car rear ended someone and got rear ended at the same time they just threw on new panels and at first glance it looked clean. But underneath was different story, the rear subframe where the lower control arm bolt to was bent, ( I’m not even sure how they were able to align it straight ) it was like the car had driven up a curb, the rear spare tire well was so crushed in that it didn’t even look like there was a well for a spare tire, the front nothing lined up ( headlights, bumper, hood ) it was a nightmare. The motor was GARBAGE, the car would smoke like crazy blue smoke from all the oil it was burning. 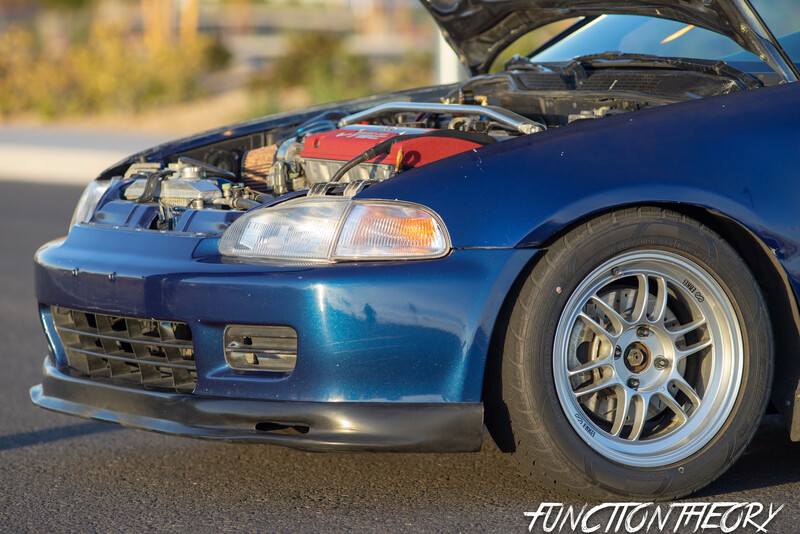 I wanted a stock civic so I traded Nate my lowering springs and koni yellows for his stock springs/shocks, I gave him this strut bar that came on the civic I bought, and a custom one I had built for the rear on my EG civic. with these mods done to his car he thought he was Mario Andretti, he was loving the civic life. he soon started to realize why his was so crappy , and why I wasn’t going to let him spend money of parts to fix it up. The writing was on the wall, he could no longer deny it. He needed a new car, his was becoming less and less reliable, and he was having to start riding his RSV4 again to work. Him and his girl had some money saved up and he was starting to look for another daily, He knew he wanted a civic because he knew that he had tasted the nectar of the gods, and needed more. His obvious choices were EG, EK hatch, this is what he was looking for except this time I was going along to look at these cars so he didn’t end up buying another lemon. we looked at a few cars but for his budget things weren’t looking too good, I asked him if there was any way to get another 500-1000 bucks together. 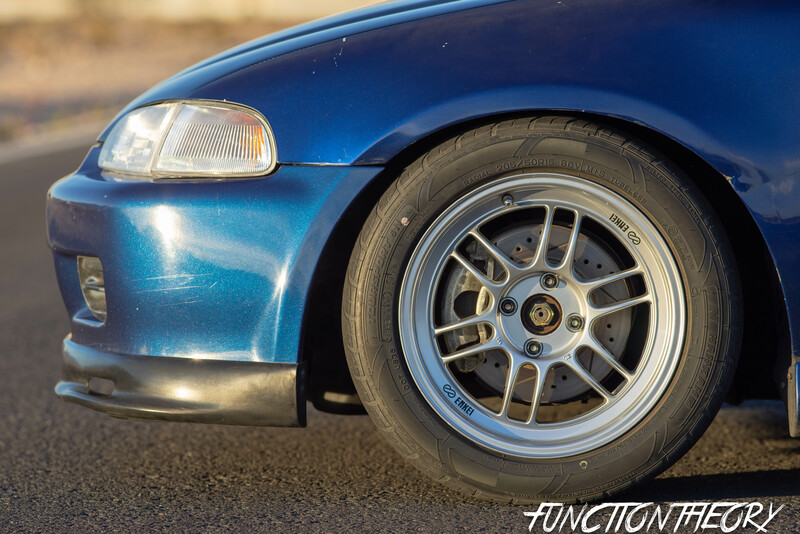 This would put us in the 3-4k range which would open up the door to many more civics that actually are pretty clean. 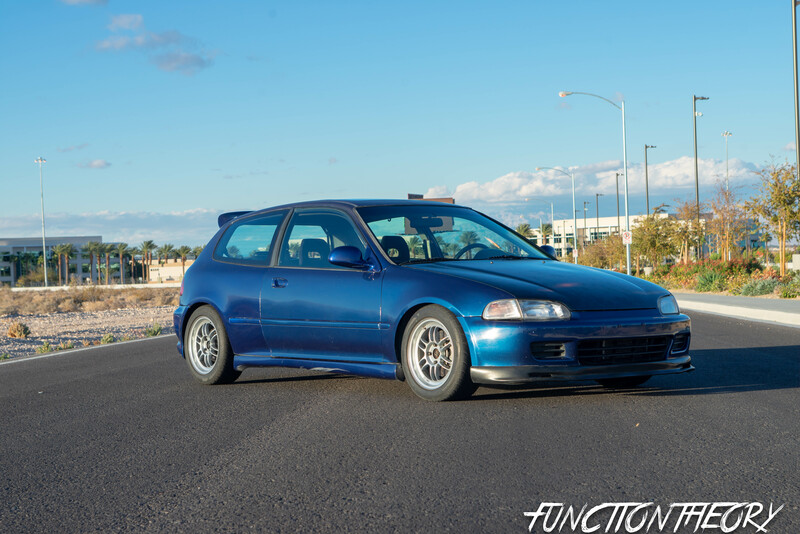 he was pretty much now looking for an EG with a b20, or some other DOHC motor, this market was pretty dry in Las Vegas since most civics are garbage, and most don’t have properly running motor swaps in them. After much looking searching he stumbled across a rare gem. 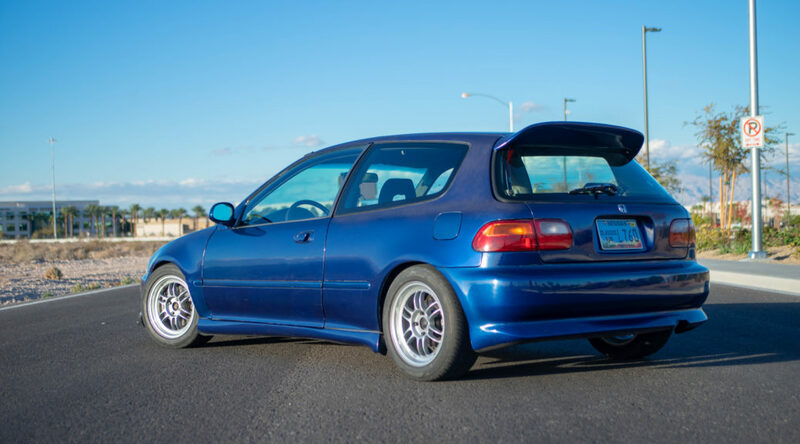 He found a 40 something Filipino guy that was selling a 92 civic SI super clean, It looked like it was stuck in a time capsule from the late 90s. The styling, the parts, and the technology was a bit dated as compared to today’s standards but added a uniqueness to the car. You could tell that this car was very loved at the time it was built, The backstory was he had purchased the car in the early 2000’s from a family member who had built the car in the late 90’s. He was selling it because he needed the space, his wife was giving him a hard time because he also had an RSX that was taking up precious garage space. 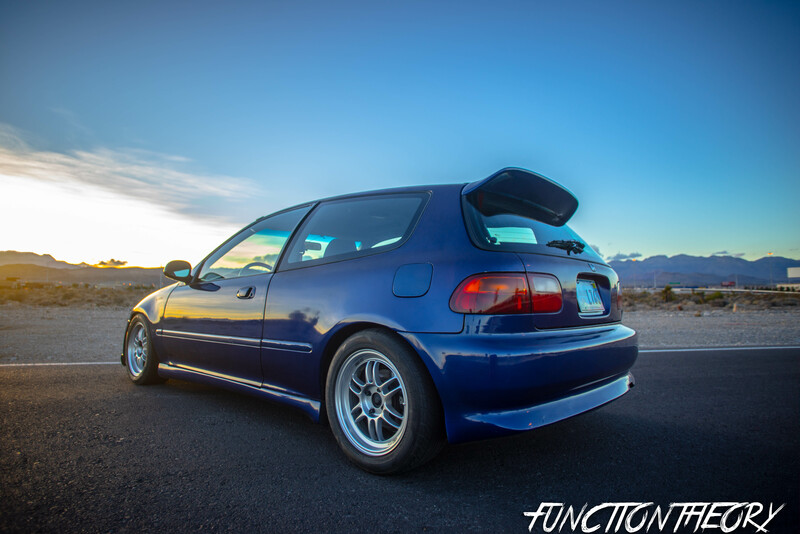 He had held onto the EG for so long for sentimental value, but he loved his RSX more so one of them had to go. Of course there are flaws/imperfections but the actual cleanliness of the chassis, interior, and unique motor swap was good enough for me. I told him that these were the main factors when trying to build a solid car, paint fade, and minor dents or dings were going to be a given. The car was sporting SSR Schumacher’s, vis carbon hood ( wrapped in carbon wrap LOL ), wings west side skirts/rear molded lip, JDM center console, jdm headlights/corners, F20B complete changeover with matching LSD trans, Fully functioning A/C, a chipped P28 ecu, and a Vtec controller. Shortly after purchasing it Nate bought skunk2 coil overs, Enkei RPF1’s, JDM cluster, ASR dog bone shifter, carbing shift knob, Megan short shifter adapter ( since its cable linkage just switching the fulcrum point of where the cable mounts can change the throw, unlike your typical B/D series linkage where only the shifter length can adjust that). Some of the issues of the car were: it didn’t come with any sway bars front/rear, it had some tacky restrictive muffler, it didn’t come with SI front brakes/knuckles. My guess is that there was some good brakes and suspension on it previously but the original owner kept all that, Brakes, sway bars, and coil overs. Ever since he bought his car he has always been hounding me to drive it, I kept telling him no thanks I’m sure it’s quick but i don’t really need to drive it. One day I finally caved and told him I would drive it. Boy was I surprised! I couldn’t believe how quick it actually was. 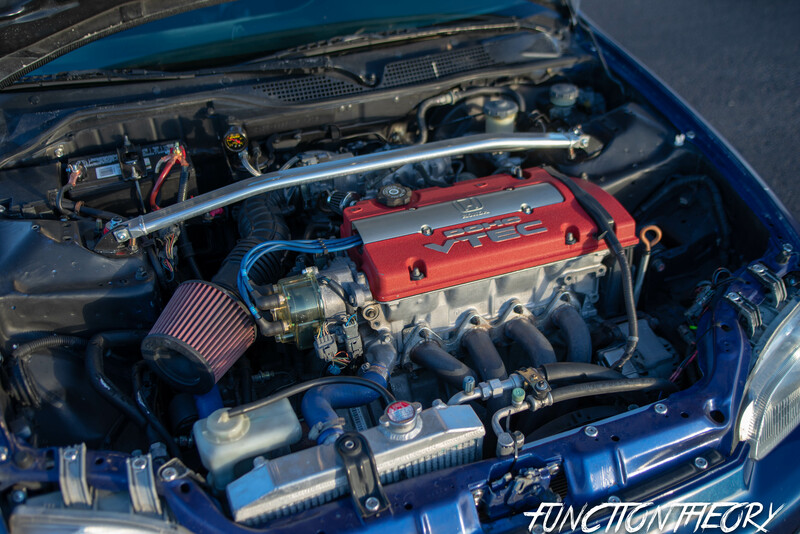 the 2.0 liter torque was good, and when the Vtec hit it just kept pulling. 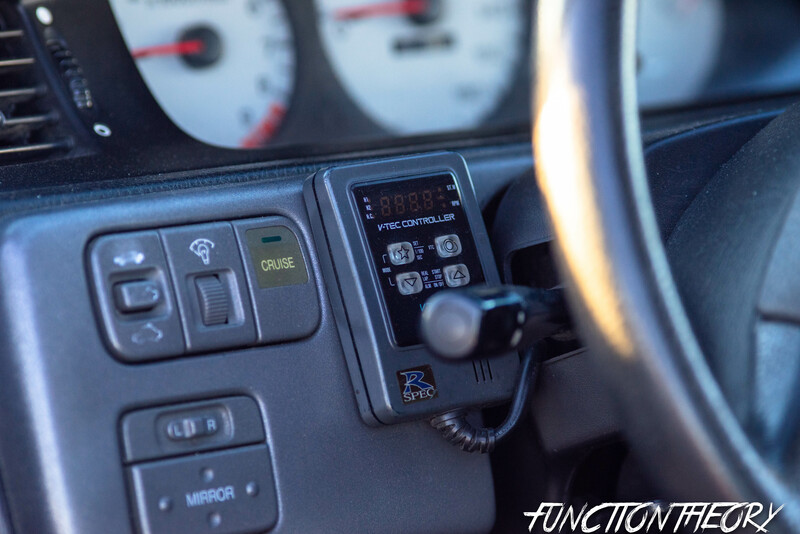 I know most people haven’t even really heard about an F20B ( my self-included ) but the thing actually holds its own, combined with the T2T4 LSD trans this car while looking somewhat plain from the outside has the heart/drivetrain of a thoroughbred. My most favorite thing about this car is that most people now days are only looking skin deep when they see this car with its ever so restrained looks, they simply look past it. 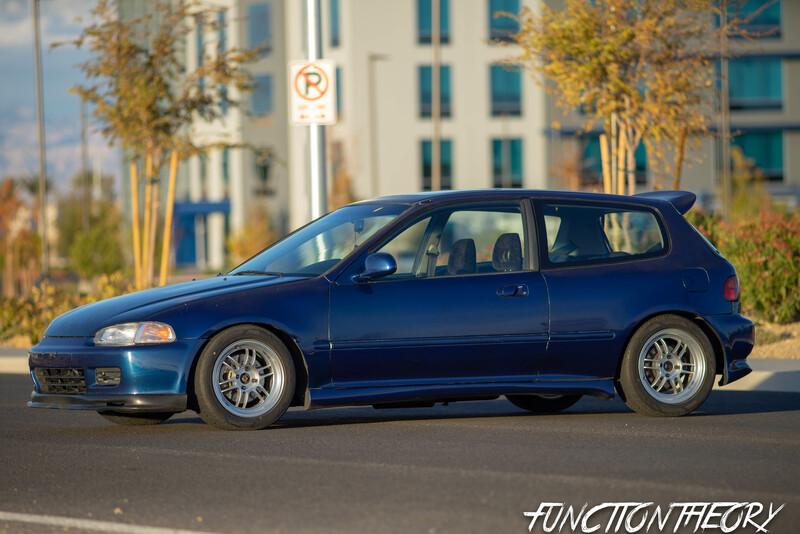 Their reactions are funny when it catches them off guard when he drops the hammer on them, and they are blown away when this modest looking civic is keeping up with them. Watching Nate acquire a taste for Hondas has been a pleasure, I love it when people truly start to understand how this once econo box car can actually be a fun little car to drive hard and put away wet. Yes I love a good clean car and i believe that its your civic duty to keep it maintained, clean, shiny, and tasteful. At the end of the day it’s not a Lamborghini, McLaren, Ferrari, or Porsche, Its got its fair share of flaws but none of that matters when you’re in the drivers seat enjoying the hell out of. It’s not going to be the end of the world if you get a rock chip, hit rabbit, or slide of into the dirt. Now days it’s so popular to focus on the outside looks and what people “think” of your car, that people forget about the actual excitement aspect of driving a car that that’s modified to increase performance rather than appearance. Nates introduction to Hondas has been a rollercoaster of a ride so far. Im thrilled to have been a part of it, and I’m proud of where he’s at so far and happy that he didn’t get discouraged after buying a lemon. I have had lots of fun learning with him along the way, and he has even taught me some new things. Its great to be more well rounded in every area of Honda, and i can’t wait to see where this car will be in another years time. Keep it functional Nate!